Why bother making homemade applesauce when you can buy it cheaply? Flavor, my friend, flavor. 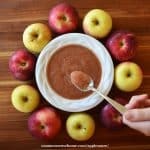 In this article, we'll share a basic applesauce recipe, plus easy recipe modifications to make it just right for you. We'll also share the best apples for sauce, ways to use applesauce in recipes and storage tips. 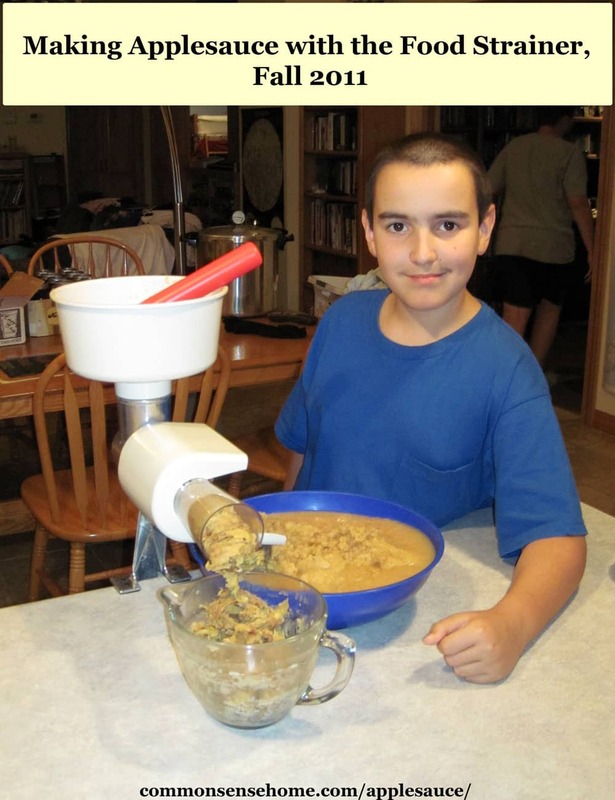 If you learn how to make applesauce, you can make it any way you like. (It's easy, I promise!) Chunky, spicy, with other fruits – you decide. You can make it on the stove top, or in the crock pot or Instant Pot. Once you've crafted your yummy sauce, you can enjoy it alone or topping anything from oatmeal to ice cream. This list is sourced from There's an Apple for That, Vermont Apples – All About Apples, St. Lawrence Nurseries Fruit Tree Comparison List and Weaver's Orchard. Some varieties listed are more common, others less so. St. Lawrence Nurseries stocks many unusual and hard to find apple trees, if you have room to expand your home orchard. Don't have these varieties? Don't worry. Most apples will soften with enough cooking – or the application of a blender or food strainer. Granny smith is a good variety to include if you like your sauce more tart and chunky. Use a mix of apples for more flavor. We gathered all the apples from our trees that were damaged and wouldn't store well, washed them, cored and sliced, and tossed them all into a big pot to cook down for sauce. Easy! The easiest homemade applesauce recipe is apples and a little water for cooking, so that they don't scorch. That's it. Remove the cores (and peels, if desired) and cook until tender. There are plenty of ingredients you can add, but you don't absolutely need them. If you start with peeled, cored apples, you can mash them into sauce with a fork, potato masher or immersion blender. Cook time = until soft, which will vary depending on the apple type and how it is sliced. Thinly sliced apples (like those from a crank corer/slicer) could be ready in 10 – 15 minutes. If you'd like to skip peeling the apples, you have two options. Either use a high powered blender or food processor to puree the skins into the sauce – or – use a food mill, food strainer or chinois to separate the applesauce from the skins. Cook your apples in a pot of the stove top (15-60 minutes, depending on size of slices), in a slow cooker (4-6 hours) or Instant Pot (8 minutes). Like your applesauce a little sweeter? Add white sugar, brown sugar or a little maple syrup. Want sauce that's a little more tart? Add some lemon juice, or add some apples that are naturally more acidic, like granny smith or Cortland. Like a little seasonal spice in your blend? Try ground cinnamon, fresh or ground ginger, nutmeg, cloves or your personal favorite. Pumpkin spice applesauce anyone? You can also add other fruits, such as strawberries or cranberries. Use your imagination! Once you taste homemade applesauce, you'll never go back to the store stuff. Add water, lemon juice and apples into cooking container – medium stockpot, crock pot, or instant pot. Mix apples to coat them with lemon. On stove top, cover and simmer until soft, stirring occasionally, for about 30 minutes. In crock pot, cover and cook for 4-6 hours. In instant pot, cook on manual (high pressure) for eight minutes. When apples are soft, remove from heat. Remove skins with a food strainer, food mill or chinois. Enjoy warm or allow to cool completely and store in the refrigerator for up to ten days. Freeze, freeze dry, dehydrate or can for longer storage. Like your applesauce a little sweeter? Add white sugar, brown sugar or a little maple syrup. Want sauce that's a little more tart? Add some lemon juice, or add some apples that are naturally more acidic, like granny smith or Cortland. Like a little seasonal spice in your blend? Try ground cinnamon, fresh or ground ginger, nutmeg, cloves or your personal favorite. For chunky applesauce (or to skip straining after cooking), peel your apples before cooking and then mash with a fork or potato masher. You can keep your sauce in the refrigerator for 7-10 days, or freeze it for around a year. Applesauce freezes well. Applesauce popsicles were one of the boys' favorite treats when they were younger. For freeze drying, process on default cycle. As a fat free food, freeze dried apple sauce should have a shelf life of 20 years or more with proper storage. 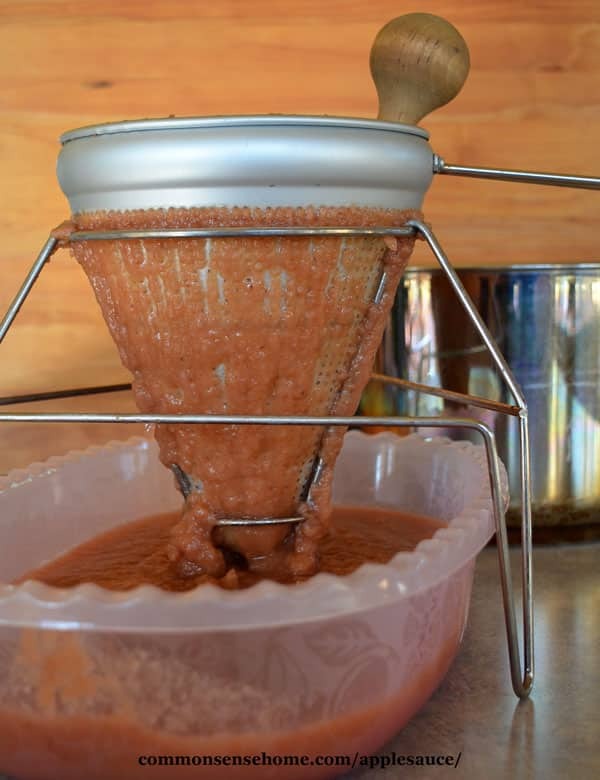 If you'd like to dehydrate your applesauce, it makes a great fruit leather all by itself, or combines with other fruits to make homemade fruit leather with no artificial anything. We have a recipe for “any fruit” leather and one for pumpkin fruit leather on the site. See “Home Food Drying – 6 Things You Need to Know to Dehydrate Food at Home” for more information on dehydrating, including using your oven for dehydrating. To can, use 1/2 inch headspace and process pints and quarts for 20 minutes in a water bath canner. To substitute applesauce for eggs in recipes like quick breads or desserts, use 1/4 to 1/3 cup applesauce per egg. This works best in recipes that call for only one or two eggs. At three or more eggs, you'll notice more of a texture difference. Adding 1/2 teaspoon baking powder with the applesauce may improve the results. 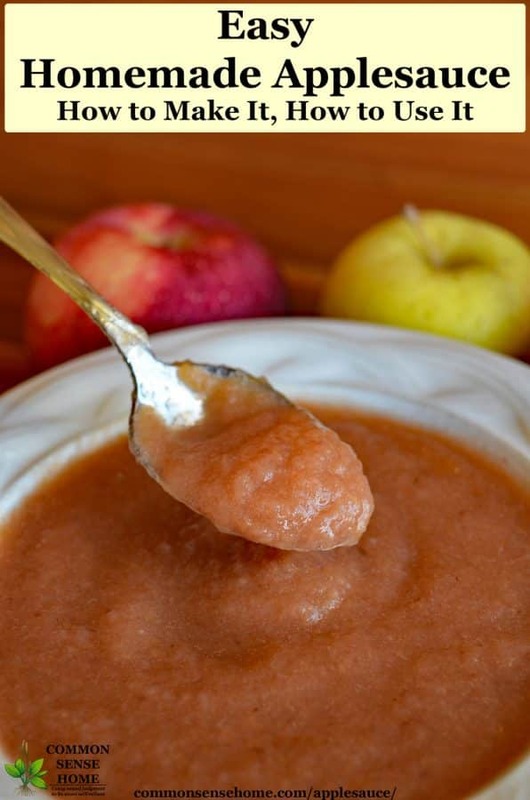 The pectin in applesauce acts as a gelling agent, allowing the sauce to be substituted for oil in recipes. To make the substitution, use a 1:1 ratio of unsweetened applesauce for oil For example, if your recipe calls for half a cup of oil, use half a cup of sauce. Be warned – this works better in some recipes than others. Your odds are better if you're replacing a vegetable oil (not butter), and if you only replace part of the oil. For example, instead of using a cup of oil, use half a cup of oil and half a cup of applesauce. How do you thicken homemade applesauce? If you don't add too much water to start, most of the time you shouldn't need to thicken your applesauce. That said, sometimes things happen. You might add excess water, or heavy rains at harvest time can make apples extra juicy. Note – leaving the skins on while cooking down the apples for sauce adds extra pectin, which helps to naturally thicken the sauce as it cools. The simplest way to fix runny sauce is to line a strainer with cheesecloth or a flour sack towel, and then put your sauce in the strainer to drain. Boom – you get apple sauce and bonus apple juice. You crack me up! What a fun video, and the applesauce looks yummy. Thank you, sweet lady. The boys and I will keep working on it and eventually get all this newfangled video stuff figured out.